2019 Team Retreat – Booking form, theme and leader. As already publicised, this year’s Retreat will run from early afternoon Friday 20th September to mid-afternoon on Sunday 22nd September 2019 at The Othona Community, near Burton Bradstock on the Jurassic Coast; check it out at www.othona-west-dorset.co.uk. On the Border: a weekend in the company of the Celtic Saints. 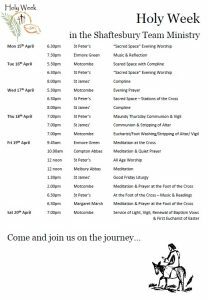 It will be led by Canon James Woodward, Principal of Sarum College, whose impressive CV is posted below. Our venue offers a smaller and simpler style in a more dramatic setting than our 2018 venture in Poole. Costs are slightly lower: £140 for single occupancy for the weekend, or £125 per person for couples or sharers. There will be an option to pay by instalments. Please send a deposit of £20 per person with your booking form, and state there if you would like to pay in further monthly instalments - £15 per month over 7 months if you book early. Bookings close 10th August 2019 or earlier if all spaces are filled, the full charge to be paid by 17th August 2019. 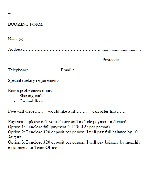 Cheques made out to Shaftesbury Team Ministry should be delivered with the completed booking form below to the Team Office in an envelope marked Team Retreat 2019. For further information, please contact Michael and Beverley Pattison, preferably by email: m.a.pattison@gmail.com. The Reverend Canon Professor James Woodward Ph.D was born in Durham in 1961. He was educated at Spennymoor Grammar School, and then at King's College London, where he read Theology. After a year working at St Christopher's Hospice in London, he spent 2 years training for Ministry in the Anglican Church at Westcott House, Cambridge. 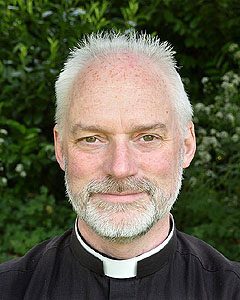 Ordained in 1985, he has worked as a Curate, a Bishop's Chaplain, a Hospital Chaplain and from 1996 in Parochial Ministry in the Diocese of Birmingham. From 1998 to 2009 he was the Master of the Foundation of Lady Katherine Leveson, Temple Balsall, Vicar of St Mary's Church and the Director of the Leveson Centre for the Study of Ageing, Spirituality and Social Policy. In this post he pioneered work in both Church and society to encourage better thinking and practice in the support and care of older people. From 2009 to 2015 he was a Canon of Windsor. He was appointed Principal of Sarum College in September 2015 and Professor of Theology at Winchester University in 2017. He chairs Salisbury Cathedral School Governors. He has written widely in the area of Pastoral Theology. He has taught in a number of universities including the Open University and in Warwick Business and Medical Schools and the University of Birmingham. He is much in demand as a speaker and lecturer. He has written and edited fifteen books. Our Team Quiet Day will be held on Saturday 2nd February 2019 at Hilfield Friary, from 10am – 5pm. 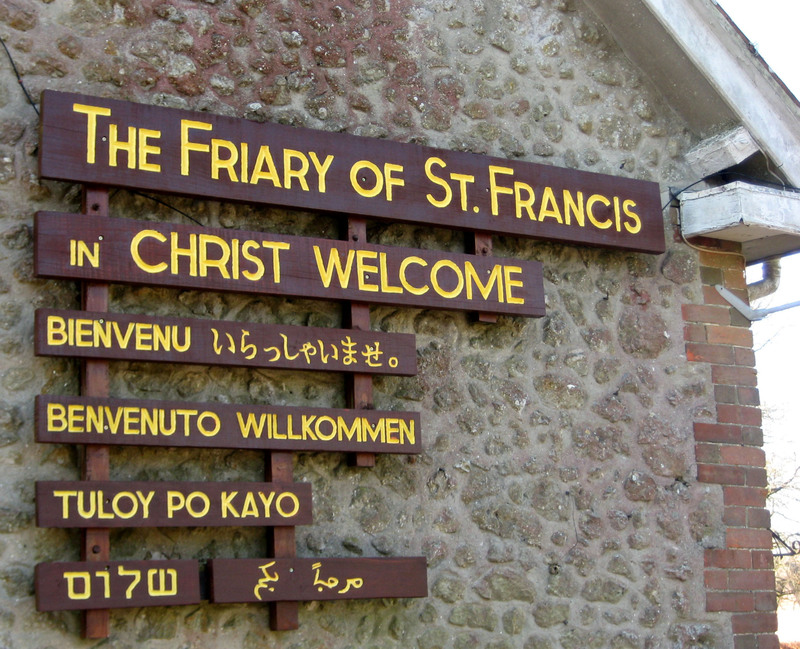 The day will include two talks by Hilfield community member, Brother Hugh, on Franciscan spirituality and how it can inform mission and spirituality in our own context. We have a maximum of 25 places available so please book early with the Team Office to avoid disappointment. Please make your own travel arrangements (sharing cars if possible) and bring a packed lunch. 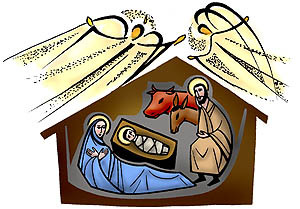 Hilfield Friary invite a donation of between £5 and £10 per person and Gift Aid forms will be available on the day. John Fuller will be leading the next Pilgrim Course on “The Bible”. 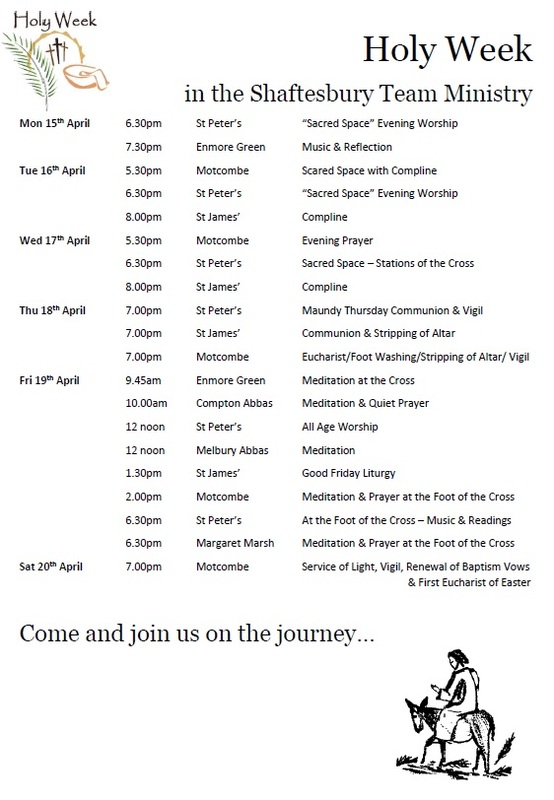 As before, there will be six sessions; the first at 7.30pm on Wednesday 10th October at 11 Ratcliffe Gardens. Everyone is welcome. For information please contact John on 01747 850079 – or just arrive! 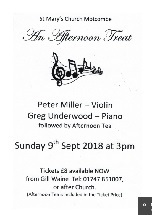 Sunday 9th September: 3.00pm - an afternoon of musical treats from Peter Miller (violin) and Greg Underwood (piano). 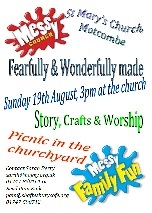 Tickets £8 from Gill Waine (01747 851007) or from Motcombe church after services. Afternoon tea is included in the ticket price. 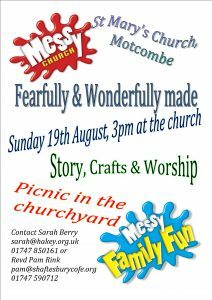 Join us at Motcombe Church for Messy Church on the theme "Fearfully & Wonderfully Made"